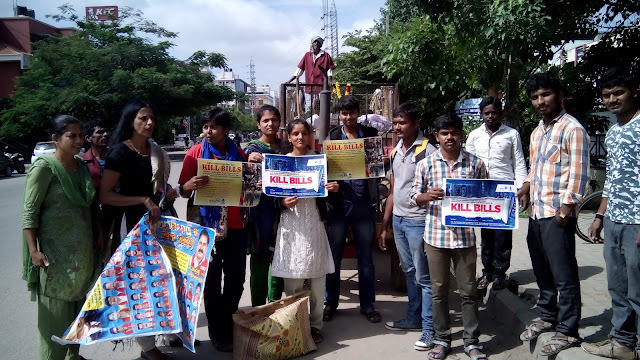 #KillBills is now a citywide event, BBMP & B.PAC on 2nd July took the HaSiRu Mithra initiative across the city with over 30 Wards participating from all 8 BBMP Zones. BCLIP, Civic Hubs, RWAs, NGOs & Citizen groups took on the fight against 'Visual Pollution' to the streets. Every Ward had a local Team and had identified a distance of 1-2 Kms where they would be removing the Posters, Bills, Banners, Flex etc that were either stick, tied or simply dangled. HaSiRu Mithra has already completed the 27th Main stretch and 17th Cross from NIFT to Nandini cool joint junction, so the choice was obvious and it was decided that the stretch from Nandini cool joint junction to BDA Complex will be taken up. With volunteers from Govt Degree College the HaSiRu Mithra Team and the BBMP PKs and Staff lead by Mr Vinayak the fight against 'Visual Pollution' started at 7.30am. Everyone seemed more than happy to bring down the ugly Banners, Flex and were seen ripping off the Posters & Bills stuck of Trees, Electric Poles. by 10.00am the #KillBills team reached and cleared most of the 'Visual Pollution' around BDA Complex and the tractor was a full load of ugliness. There is hope that BBMP will file cases against these illegal and ugly Posters, Bills, Banners, Flex that are defacing the locality and city. 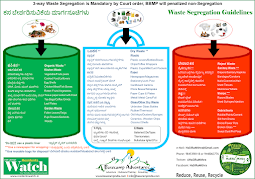 HaSiRu Mithra will be submitting a report on list of offenders BPAC which will be then sent to BBMP for action. With more citizen participation and vigil it will not be difficult to put an end to the 'Visual Pollution' in Bengaluru.